The final 19 players are now on the bubble, and hand-for-hand play is now in progress. 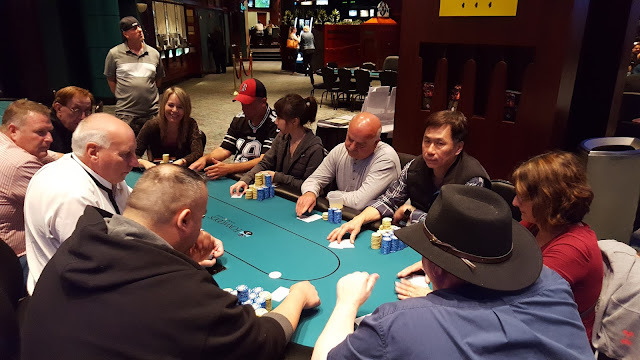 They will continue the hand-for-hand portion of play until at least one player has been eliminated, leaving the remaining players in the money, and guaranteed at least $653. A few notables still in the field include: Chris Smith, Laurie Hilton, Fred Paradis, Anthony Midolo, and Dileep Patel. The flop comes A♠J♣8♦, pushing Pupillo further into the lead when he flops a set of aces. He maintains that lead when the turn comes the Q♣, but the 10♦ arrives on the river, giving Liu a straight to win and hand and eliminated Pupillo in 2nd place. Liu takes home the Main Event title, the trophy, and $114,356. The final two players are now on a 60-minute dinner break. They will return to play down to a winner around 6:55 pm ET. Facing a raise from Jia Ming Liu on the button, and a call from Nick Pupillo in the small blind, Evan Paushter moves all in from the big blind for around 1,000,000. Liu pauses for a few moments before shoving all in, and Pupillo folds. "Was that a slow roll?" Paushter asks Liu, referring to him pausing to think before acting. "Not at all, I just had to think about what to do since he (Pupillo) was involved in the hand as well," Liu responds. "Well, I have clubs," Paushter says as he stands and starts collecting his belongings. "Sit down, the clubs are coming," a friend of Paushter's says from the rail. But the turn is the 5♥, and Paushter knows he will need a jack to stay alive. The river is the 10♠, and Paushter is eliminated in 3rd place. Michael Ferraro moves all in on the button for his remaining 40,000, and Curt Kohlberg calls. The board runs out K♠J♦J♣10♦3♣ awarding Kohlberg the pot with his ace high, and eliminating Ferraro in 2nd place. Kohlberg went on quite a run to take this tournament down. He was the first player to cross the 100,000 chip mark, and held the chip lead from beginning to end. Congrats to Kohlberg on an amazing win. Arthur OHannessian moves all in for 400,000 on the button, and Nick Pupillo calls in the small blind. The board runs out J♦3♦2♦4♠6♣. Pupillo's queens hold up, and OHannessian is eliminated in 4th place. Just one hand ago, Brian Landesman lost a good chunk of his stack after doubling up Arthur Ohannessian. This hand, Landesman is all in for 330,000 holding 5♣5♠, and has been called by Nick Pupillo holding 9♦9♥. Landesman is behind, but only until the flop comes Q♠5♦2♦, giving him a set to take the lead. He maintains that lead when the turn comes the 10♦. "Diamond," a player at the table says, just before the river comes the 4♦, giving Pupillo a flush, and eliminating Landesman in 5th place. In a blind vs. blind situation, Arthur Ohannessian is all in, and at risk against Brian Landesman. The flop comes 10♦8♣4♥, leaving Landesman in the lead, but the K♦ turn gives Ohannessian the lead with a pair of kings. Fortunately for Ohannessian the river is the J♦, giving him a set to double up. Mike moves all in from under the gun for 260,000, and Evan Paushter calls in the big blind. The board runs out J♥9♦6♣2♠6♠, awarding Paushter the pot, and eliminating Mike in 6th place. Barnard Lee moves all in for a little over 110,000 in the small blind, and Curt Kohlberg calls in the big blind. Lee is in good shape holding 7♣7♠ against Kohlberg's 5♥5♦. But that changes when the flop comes J♣10♦5♠, giving Kohlberg a set of fives. The 2♥ on the turn does not change much, and the 5♣ river only improves Kohlberg to quads. Lee is eliminated in 3rd place, and takes home $12,532. Eric Panayiotou moves all in on the button for around 50,000, and Bernard Lee calls in the big blind. The board runs out Q♠5♣2♠2♥6♥, awarding Lee the pot with his ace high, and eliminating Panayiotou in 4th place, with three places paid. All remaining players are now in the money, and guaranteed at least $12,532. The remaining six players are now on a 15-minute dinner break. They will return to play level 25, with 15,000/30,000 blinds, and a 5,000 ante. The average stack is 1,015,000. Full chip counts of the remaining six will be taken over the break, and posted shortly. There were a total of 162 entries in today's $300 NLH super stack event. Those entries generated a prizepool of $40,856, with 18 spots making the money. Eugene Roemischer moves all in from the hijack for 354,000, and Brian Landesman calls on the button. Both blinds fold, and the players table their hands. The board runs out Q♥10♦8♣9♥A♣, eliminating Roemischer in 7th place. Kenneth Rawlinson is all in from the cutoff for around 395,000, and has been called by Nick Pupillo on the button. The flop comes A♥8♠6♦, giving Pupillo the lead when he makes a pair of aces. He increases that lead when the turn comes the J♣ giving him two pair. Unfortunately for Rawlinson, the 2♣ river does not improve his hand, and he is eliminated in 8th place, taking home $14,719. Larry Greenberg is all in holding K♦Q♥, and has been called by Eric Panayiotou holding 8♥8♠. The board runs out J♣7♦4♦6♦4♣, awarding Panayiotou the pot, and eliminating Greenberg in 5th place. "King queen just wasnt working out for me today," Greenberg says as he stands and gathers his belongings while preparing to leave the tournament area. Ari Engel is all in pre-flop, and has been called by Curt Kohlberg. The board runs out 8♣7♣7♥10♣2♥, increasing Kohlberg's lead when he makes a pair of tens, and Engel is eliminated from play. Facing a raise from Nick Pupillo, Stephan Porter moves all in from the small blind for around 200,000, and Pupillo called. The board runs out 10♥10♠9♦5♥4x, eliminating Porter in 9th place. Porter nursed a short-stack nearly the entire tournament and worked extremely hard to get to the final table. Congratulations on the deep run Stephan! There were a total of 17 entries in the $4,000 High Roller Event. Those entries generated a prizepool of $62,662, with 3 sports being paid out. Carlo Marotta raises to 8,152 from under the gun, and a player that wishes to remain annonymous re-raises to 150,000 in middle position. Marotta quickly moves all in for his remaining 175,000, and his opponent calls. The flop comes A♥3♦2♣, giving Marotta the lead with a pair of aces, king kicker. He maintains that lead when the turn comes the 9♦. But the Q♣ on the river gives Marotta's opponent two pair to win the hand, and Marotta is eliminated in 10th place. Eracles 'Eric' Panayiotou opens on the button, and Zach Donovan moves all in from the big blind. The board runs out Q♠4♣5♦7♦6♠, awarding Panayiotou the pot, and eliminating Donovan in 7th place. A few players at the table re-capped the hand for the foxwoodspoker.com blog staff, and table mate Ari Engel joked, "Eric looked at the three of spades and that was all." A few players giggle as they move on to the next hand. Players are allowed to buy directly into Day 2, prior to today's 1 pm start time. A total of 14 players are advancing to Day 3 in the $2,500 World Poker Finals Main Event. Play resumes on Monday October 16th at 11am, and will play down to a winner. 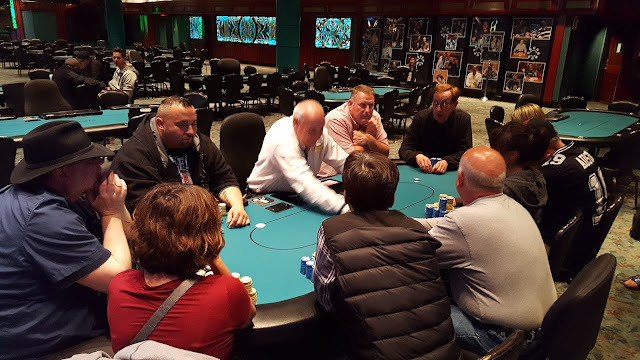 The final 14 players in the Main Event have bagged up their chips for the night, and will return to play down to a winner tomorrow Monday Oct. 16th at 11am. A full list of advancing players will be posted within the hour. Michael Forrest moves all in for 18,875 in early position, and Ari Engel calls in the cutoff. Bernard Lee shoves all in over the top on the button, and it folds back to Engel who goes deep into the tank. Nearly three minutes pass before Engel mucks his hand. Bernard turns over A♣A♦, and upon seeing his cards, Engel shows the K♥K♦ he mucked. Forrest shows A♥K♣. The board runs out 9♠6♣2♥9♥5♠ awarding Lee the pot, and eliminating Forrest from play. There are now 21 players in the Main Event, and all are officially in the money. A few notables still in are: Nick Pupillo, Roland Israelashvili, Eugene Roemischer, Alex Karnaos, Julian Sacks. Zach Donovan, Stephan Power, and Brian Landesman. We have reached the hand-for-hand portion of play. There are 22 players remaining, and 21 of them will make the money. This portion of play will continue until we lose one player, and all remaining players will be in the money and guaranteed at least $6,340, with the winner taking home $114,356. Curt Kohlberg was the first player in the highroller to double their stack and cross over the 100,000 chip mark after he eliminated Michael Farris from play. Ari Engel is inching closer to crossing over himself. It folds around to Larry Greenberg in the small blind who limps in. Engel raises to 1,400 in the big blind, and Greenberg re-raises to 2,400. Engel calls. The flop comes Q♥10♠10♦. Greenberg checks, and Engel checks behind. The turn is the 9♣ and both players check again. The river is the 2♥. Greenberg checks, Engel bets 2,350, Greenberg pauses for nearly 30 seconds and then calls. Engel turns over 6♣6♦, and Greenberg mucks without showing. 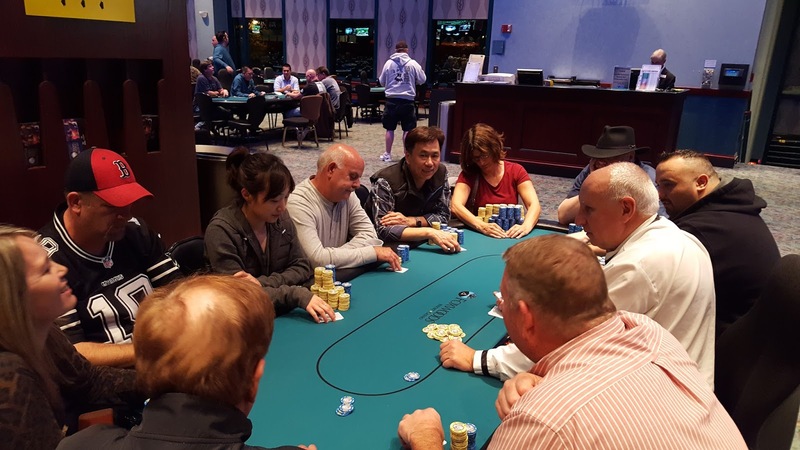 Below are photos of the early registrants in the $4,000 High Roller Event. The board reads Q♣J♣4♠, and Johanssy Joseph checks in the big blind. Nick Pupillo bets 18,000 on the button, and Joseph moves all in. Pupillo quickly calls and Joseph says, "Uh oh," as he turns over J♥4♣ for two pair. Pupillo shows Q♦J♥ for top two pair. The 8♠ turn and 6♣ river do not change the hand, and Joseph is eliminated just shortly before the money bubble. 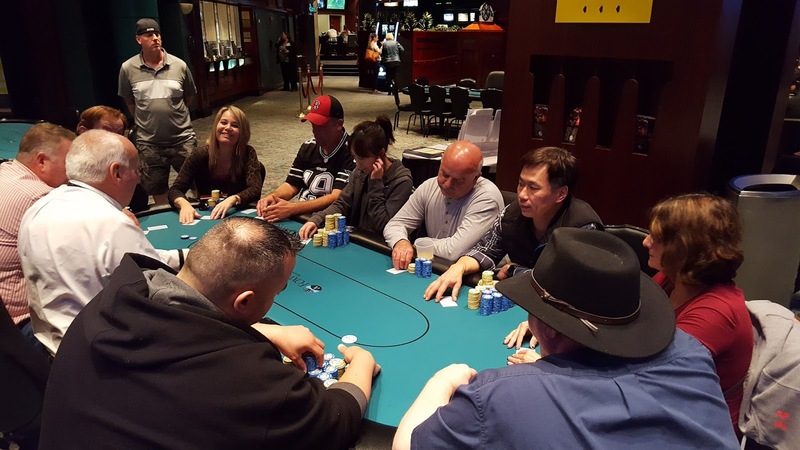 There were a total of 95 entries in today's $300 NLH freezeout event. Those entries generated a prizepool of $24,250, with 12 spots making the money. Ari Engel raises to 600 on the button, and Bernard Lee calls in the small blind. The flop comes 8♣3♠2♠. Lee checks. Engel bets 750, and Lee calls. The turn is the J♠. Lee checks again, Engel bets 2,200, and Lee calls. The river is the 4♦. Lee checks one last time, Engel bets 6,150, and Lee snap-calls. Engel turns over A♠5♦ for a rivered straight. Lee scoffs and quickly tosses his cards into the muck. Anyone wishing to enter this tournament has until the start of play tomorrow to enter/re-enter. The remaining 29 players are now on a 60-minute dinner break. They will return to play Level 17, with 2,500/5,000 blinds, and a 500 ante. Play will continue until the end of Level 20, or until the final table is reached, whichever comes first. There is around 30,000 in the middle, and the board reads 10♥5♦3♦. 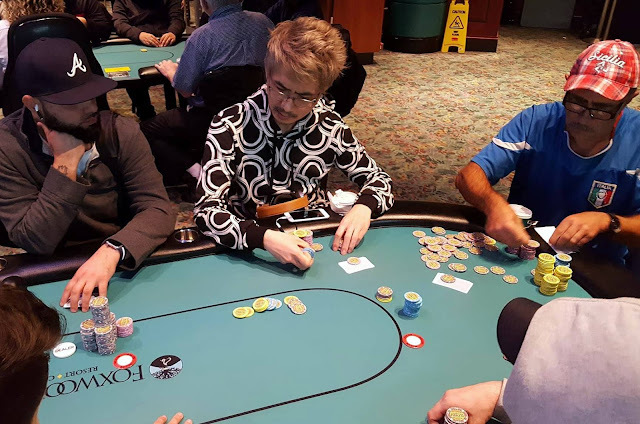 Mirsad Rugova bets 22,500 in the small blind, and Charles Hawkins moves all in from the big blind. The cutoff folds, and Rugova asks the dealer to pull in the 22,500. The dealer tells Mirsad it's an additional 65,500 to call, and Mirsad thinks for nearly a minute before calling the all-in. Hawkins is in good shape holding 10♣9♣ against Rugova's 10♦7♣, but the 7♥ on the turn gives Rugova two pair to the take lead. The river is the 4♥, and Hawkins is eliminated from play. "I thought he was on a flush draw," Rugova says after Hawkins has walked away from the tournament area. Mirsad Rugova is now the chip leader of the tournament. There's around 30,000 in the middle, and the board reads K♠4♠4♥10♠. Nick Pupillo checks, and Giuseppe Ruvolo bets 25,000. Pupillo raises to 62,000. Ruvolo confirms the total bet, and then calls. The river is the 4♦. Pupillo pauses for a few seconds before moving his biggest stack of chips forward, putting Ruvolo all-in should he choose to call. Ruvolo quickly calls and turns over K♥10♥ for a full house. But unfortunately for Ruvolo, Pupillo holds K♣K♦ for a bigger full house, to eliminate Ruvolo from play. "What the heck? What am I supposed to do there?" Ruvolo asks as he stands up from the table and prepares to exit the tournament area. The remaining 38 players in the Main Event are now on a 15 minute color-up break. They will return to play level 15, with 1,500/3,000 blinds, and a 500 ante. The average stack is 160,263. Sidney Farber moves all in in early position, and Roland Israelashvili quickly calls in the big blind. The board runs out 10♥6♠4♦Q♦10♠, and Farber is eliminated from play. Giuseppe Ruvolo was found scooping a monster sized pot, at the expense of Luis Vazquez. The board read 10♦10♣3♣2♣2♦. The dealer was counting down Ruvolo's stack, and he had 2♥2♠ sitting in front of him. Vazquez had A♣9♣ in front of him. Ruvolo said that after many raises and re-raises on the turn, they two players got it all-in, full house vs. nut flush. While Ruvolo didn't need the two on the river, it did improve him to quads, just for good measure. The very next hand it folds to Vazquez on the button who moves all in for his remaining 15,000. 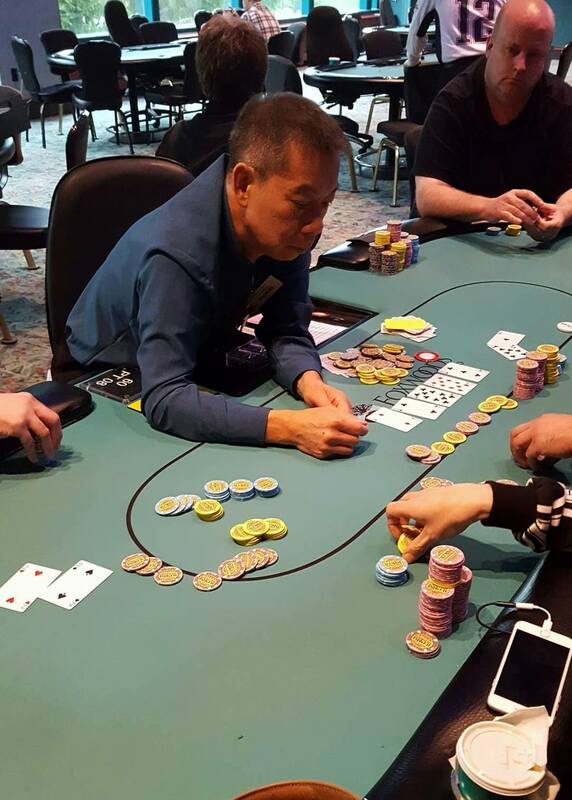 JeWook Oh raises to 26,200 in the small blind, and Ruvolo moves all in, having both players covered. Oh thinks for nearly a full minute before mucking his hand. The board runs out clean, and Vazquez is eliminated from play, while Ruvolo is pushed nearly to the 300,000 chip mark. Busted @FoxwoodsPoker $2500 main. After kings debacle lost AJss to shortie AK Kss flop. Then shoved last 5bb sb v bb 97dd vs 63. Flop 93xx3. Action folds to the player on the button who raises to 4,500. 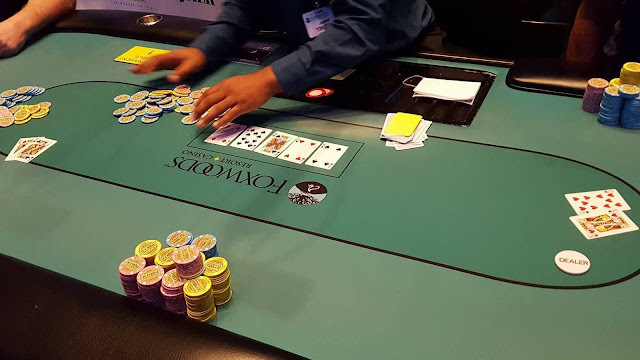 Alexander Karnaos moves all in from the small blind, and the button calls. The board runs out 10♥4♥2♠2♣K♥. The dealer counts out Karnaos' 15,100 in chips, and passes them over from the button's stack. Event #18 is now underway, and registration is open until the start of Level 9. Due to the freezeout nature of this tournament, re-entries are not allowed. Once a player is eliminated from play, they are not able to enter again. This will be a 2-day tournament, and play will conclude this evening after level 18, or once they reach the final table of ten, whichever comes first. Players will soon embark on their first 15-minute break of the day. The field has been thinned by over 25 players in the first two levels. A few of the casulties included Tim Reilly, Stephen Song, Gennadiy Kostrov, Ari Engel, and David Stefanski. Luis Vazquez was another player that chose to directly buy into Day 2, and start with 30,000 in chips. He has since substantially chipped up. Stephan Porter opens on the button to 4,000, and LJ Sande calls in the small blind. Luis Vazquez raises to 26,000, and Porter quickly folds. Sande goes deep into the tank, looks at his stack, thinks for nearly two minutes, and then moves his remaining 40,000 forward to shove all-in. Vazquez quickly calls, and the players table their cards. The board runs out A♠K♣2♠J♠9♣, eliminating Sande from play, and awarding Vazquez the pot to push him just over the 100,000 chip mark. After Sande has walked away from the table Vazquez looks at Porter and asks, "I assume you folded the ace?" Porter nods yes, and Vazquez goes back to stacking up his chips. After the additional 13 players to direct buy into Day 2, there were a total of 203 entries in the $2,500 NLH Main Event. Those entries generated a total prizepool of $452,894, and the top 21 places will be paid out.